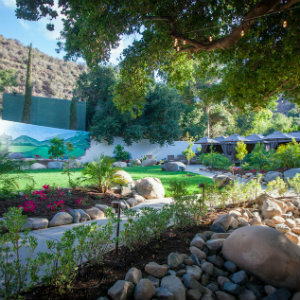 Glen Ivy Hot Springs in Corona just unveiled a new Secret Garden offering guests an opportunity to explore an exciting new oasis on the grounds. The serene and expansive garden presents the perfect place to relax under a canopy of oak tree branches or enjoy private cabanas surrounded by fruit-bearing trees. Reserve a Secret Garden Cabana to enjoy a selection of seasonal fruits, citrus infused water, and hosted service from a dedicated cabana menu. Guests of the Secret Garden will also receive luxurious bath robes, reserved parking and access to sun loungers. During peak season, March through October, guests can reserve a Secret Garden Cabana for 2-4 guests, with pricing varying based upon the day of the week. Cabana Reservations, March through October--up to 4 guests: Tuesday - Thursday, $250; Friday – Monday, $275. To make a reservation at (888) 453-6489. Visit glenivy.com for more information. Glen Ivy Hot Springs is at 25000 Glen Ivy Road in Corona.